What’s the best charger for my AGM batteries? Well, you will find the answer in this article. We review several excellent models that we believe are best suited to your needs. AGM (absorbed glass mat) batteries have become much more common over the past few years since they can provide high current and their cost is relatively low. AGM batteries can come in starting and deep cycle and are well suited to most systems as they are completely sealed they can’t be spilled, do not need periodic watering, and emit no corrosive fumes, the electrolyte will not stratify and no equalization charging is required. Some folks said that they prefer AGM to other types of batteries because of the fact that it can be mounted in any position, take it off-road, jump your truck a bunch of times and still have a battery that works. General speaking, AGM batteries are maintenance free, provides good electrical reliability and less prone to damage caused by vibration. However, nothing is perfect. As with all gelled and sealed units, AGM batteries have one major disadvantage: they are especially sensitive to overcharging. This kind of battery has a different charging requirement based on its specific design. Charging AGM batteries properly is complicated by the fact that some, perhaps most, traditional battery chargers will grossly overcharge them. Why? Because a traditional charger can monitor how many amps it’s supplying at its output, but there is no way for it to detect when the battery is fully charged. Fortunately, we tested several smart chargers that are perfect for charging AGM batteries and won’t harm your batteries under any circumstance. Now, take a look at some of the best AGM battery chargers that we’ve compiled below. Based on our testing, professional and user reviews, the NOCO Genius G7200 UltraSafe Smart Charger is our pick for the absolute best AGM battery charger. This charger can be used for both 12V and 24V lead-acid and lithium-ion batteries. It also can be used as a battery maintainer to keep both starter and deep-cycle batteries fully charged. In terms of reliability, NoCo battery charger is a brand you can trust. It’s an American, privately held, multinational corporation that was founded in 1914. Since then, the company has been creating and designing premium consumer battery chargers, jump starters, solar panels, and portable power devices as well as a wide range related battery products and accessories. The thing we love most about NoCo battery chargers is that all of them are made with the safety and in mind. 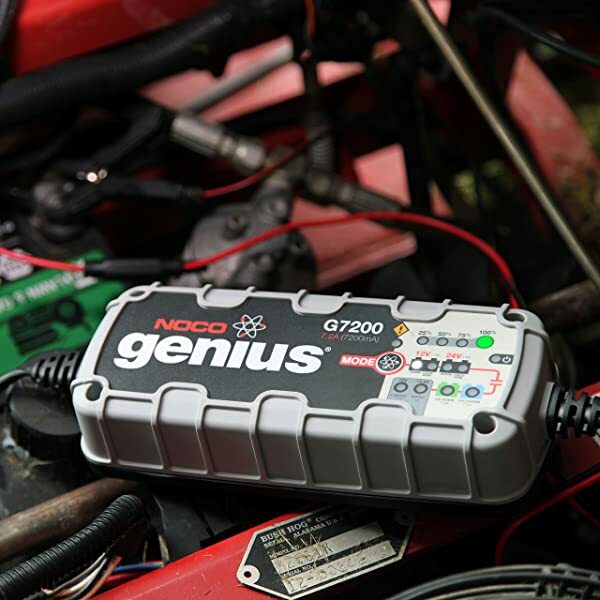 The NOCO Genius G7200 is a perfect choice for AGM batteries. 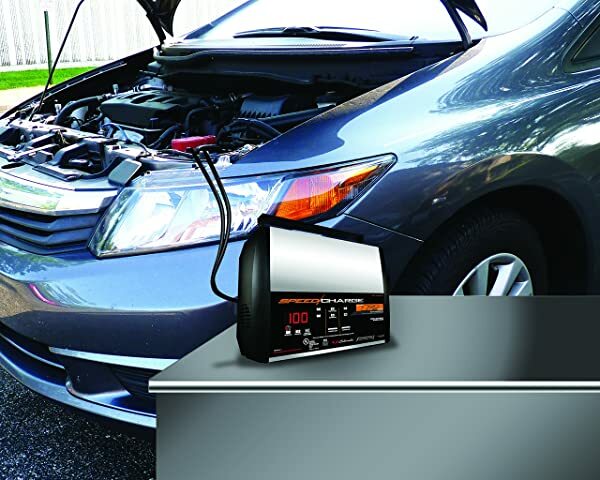 It is able to charge an AGM deep cycle battery 2 times faster than an ordinary charger. Actually, this charger could greatly reduce the charging time of any kind of deep cycle or starting battery that you have. Another advantage of all NoCo Genius smart chargers is that they are extremely lightweight and incredibly portable. These chargers utilize the latest advancements in battery charging technology converts energy 30,000 times faster than traditional automotive battery chargers. This helps the charger to minimize their energy consumption. The second best AGM battery charger is the CTEK (56-353) MULTI US 7002 12-Volt Battery Charger. We tested this charger and found that it charges an AGM battery as good as our top-pick NoCo. However, there are two things that held this model back from our top spot: it’s more expensive and it can’t charge lithium-ion batteries (that doesn’t really matter if you don’t intend to use lithium-ion batteries in the future). About Ctek, this is a Swedish company and is one of the global market leaders in battery management solutions. The company produces some of the top-of-the-line battery chargers for cars, trucks, and marine applications. Let’s see what Jay Leno says about Ctek battery chargers in the following video. The CTEK MULTI US 7002 is a charger that offers state of the art technology that was previously only found in CTEK’s professional product range. The charger can solve a broad range of battery-related problems and is the perfect charger for those with high demands. It claims to be the smartest in the world with its unique eight-step charging process. #Step 1: Pulsing voltage removes sulfates from the lead plates of the battery restoring the battery capacity. #Step 2: Tests if the battery can accept charge. Charging begins if the battery is OK.
#Step 3: Charging with the maximum current until approximately 80 % battery capacity. #Step 5: Tests if the battery can hold charge. Batteries that cannot hold charge may need to be replaced. #Step 6: Reconditioning function for deeply discharged batteries. #STEP 7: Maintaining the battery voltage at maximum level by providing a constant voltage charge. #STEP 8: Maintaining the battery at 95–100 % capacity. The charger monitors the battery voltage and gives a pulse when necessary to keep the battery fully charged. These 8 steps combined with Ctek’s innovative technologies allow the Multi US 7002 to move far beyond the capabilities of other 12V chargers, even to the point of determining whether a battery can hold the charge given, and in the process ensure that each of your lead-acid vehicle batteries gets the best possible care. If you already have an XS Power AGM Battery, you would know that this battery is excellent and performs better than most AGM batteries from other brands. And once you use the XS Power HF1215 12V 15 Amp High Frequency AGM IntelliCharger to charge your 12V AGM batteries, you will never want to use any other battery charger. This is one of the best AGM battery chargers that we love most, though, it’s relatively expensive compared to others of the same output rating. 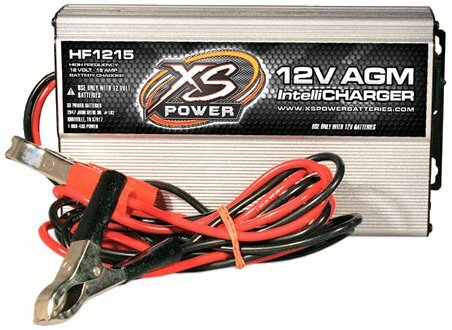 The XS Power HF1215 charger is designed specifically for high performance 12V sealed lead-acid batteries. This charger combines the reliability of a High Frequency MOSFET rectified assembly with an advanced microprocessor control board to create a battery charger that can rapidly and safely recharge 12V maintenance free, deep cycle, gel-cell, and AGM (Absorbed Glass Mat) batteries in several sizes. This charger features three distinct charging stages. During the first stage, called “Bulk” charging, the current is fixed and the voltage is allowed to float. During this stage, 80% of the battery’s capacity is restored. When the battery’s cell voltage is up to the correct level, the second stage called “Absorption” charging is engaged. During this stage, the voltage is fixed and the current is allowed to float. The battery is brought to 100% during this stage and the cells are equalized. The third stage is “Float” charging. During this stage, the voltage and current are reduced to a level that will maintain the battery indefinitely. These 3 stages will prevent your AGM batteries from overcharging. With more than 40 years history of technological innovation and engineering, Optima offers some of the best chargers for AGM batteries on the market. We are so confident that the Optima Digital 1200 will enhance the performance of your 12V AGM batteries as well as other high-performance flooded batteries. It will also recover your deeply discharged batteries and helps extend battery life. Convenient features of the Optima Digital 1200 include an in-clamp LED work light for connections in dark conditions and a 5 Watt USB charging port compatible with iPad, iPhone, Android phones, cameras, digital video recorders and other USB powered devices and accessories. It also features integrated ergonomically designed non-slip DC charging clamps housed in a rear compartment for easy access and storage. Stage 3: Fast charge bulk mode for batteries moderately discharged – also known as normal battery usage. Stage 6: A 30-day storage recondition mode – while your vehicle or battery is in storage and is being maintained. 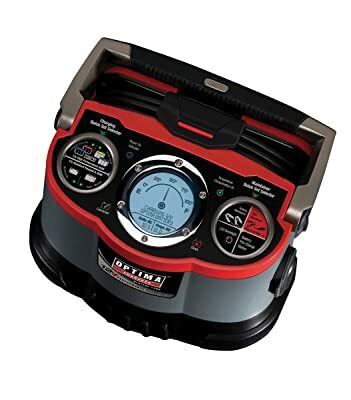 One of the major advantages of the Optima Digital 1200 is the ability to charge a dead battery. While many 12V chargers won’t charge a battery that has less than 10.5 volts, this charger will recognize and charge a battery that is as low as 1.25 VDC. Of course, you could always use a jump starter to jump-start the battery and let it charge the battery enough for the charger to recognize it, but why you need a jump starter while a charger can do everything for you. You get what you pay for, but this one is an exception. The Schumacher SC-1200A-CA SpeedCharge is the best AGM battery charger for the price. It is a battery charger that is completely automatic and is controlled by a microprocessor. Advanced microprocessor controlled algorithms monitor the charging process to avoid battery damage caused by overcharging. Simply put, the charger collects information from the battery and adjusts the charge current and voltage based on this information. This allows the battery to be charged quickly, correctly, and completely when using a microprocessor controlled battery charger. With 6V/12V auto voltage detection, this charger can do 3 Amp for maintaining, 6 Amp for medium charging and 12 Amp rapid charging. The higher the amp setting, the faster your battery will charge. One of the most advanced chargers for AGM batteries is the BatteryMINDer 128CEC1 Battery Charger. This charger can determine the level of charge remaining in the battery, and if weak and in need of replacement, before going bad. In addition, it tests for weak cells and will recover weak or severely discharged batteries that other chargers would reject. Therefore, we’d highly recommend this charger for batteries that have been neglected and abused. The BatteryMINDer 128CEC1 is regulated and will not overcharge, no matter what amp selection you make. It is just a matter of how fast you need to charge the battery. The BatteryMINDer 128CEC1 is a quality battery charger that can replace all of your older models. The safety features and smart technology are state-of-the-art and are suitable for all users, both novices and professionals. The lightweight, compact design makes it easy to store and transport wherever you need it.